NYC, 03/01/2019, 7:00PM. 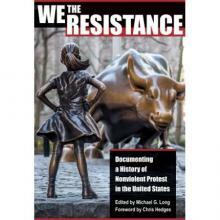 We the Resistance: Documenting a History of Nonviolent Protest in the United States. Michael Long presents his new anthology, a first-person history of nonviolent resistance in the U.S., from pre-Revolutionary America to the Trump years. This alternate history of the formation of our nation—and its character—is one in which courageous individuals and movements have wielded the tools of nonviolence to resist unjust, unfair, and immoral policies and practices.